Amazon isn’t the problem with capitalism. It’s the solution to our economic ills. Jeff Bezos’ company is not the problem with American capitalism. It’s the solution to our economy’s ills. 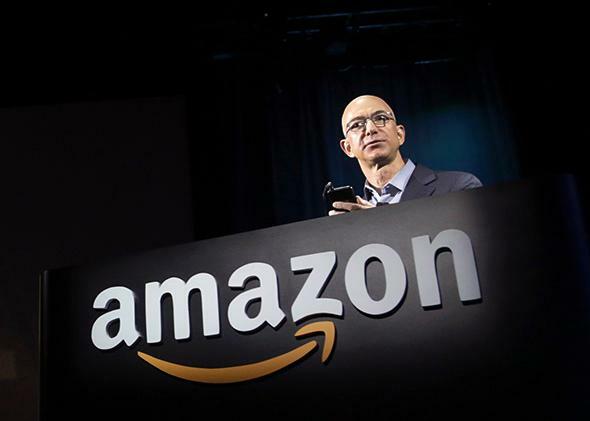 Amazon CEO Jeff Bezos at a news conference in Seattle on June 18, 2014. The concept of monopoly merits closer scrutiny. A pair of Slate alums, Annie Lowrey of New York and Matt Yglesias of Vox, have both noted that Amazon is not a monopoly according to a strict definition of the term. Lowrey observes that although Amazon does indeed have a formidable and perhaps even monopolistic position in the book market (I don’t agree, but we’ll get to that), it certainly doesn’t have a monopoly on e-commerce, where it represents 15 percent of all sales, let alone retail as a whole, where Amazon is but a pygmy. Yglesias argues that if anything, Amazon is “the reverse of a monopoly.” Instead of rigging the retail business in its favor by fattening its margins and exploiting its dominant position in a handful of niches, it is so cutthroat that it sometimes appears to be cutting its own throat, as evidenced by the fact that the company loses a boatload of money. Of course, neither of these arguments disproves Foer’s contention that Amazon is getting more and more dangerous over time and that its willingness to undercut competitors will eventually give it a stranglehold over American retail. Foer believes that Amazon is so formidable that its growth to date is just the tip of the iceberg and that its willingness to take losses now is all about laying the groundwork for a more lucrative future as (just about) the last retailer standing. Moreover, he sees Amazon as the poster child for a new generation of tech monopolies. So it is worth thinking through exactly how Amazon is distinctive. Foer cites a provocative argument PayPal co-founder Peter Thiel makes in his new book, Zero to One. According to Thiel, creative monopolies deserve praise and not scorn. To many, this is just a bunch of Silicon Valley flimflam. Yet Thiel is making an important and easily misunderstood point. When he writes that “capitalism and competition are opposites” and that monopolies are good, he is really arguing that entrepreneurs should aspire to create companies that aren’t just doing what everyone else is doing, but rather have a unique, contrarian theory as to how the world works. When the prevailing view is that, well, there hasn’t been a new automobile company in decades so there’s no point in trying to launch a new one, Thiel’s model entrepreneur comes along and says that the world has changed and an integrated, soup-to-nuts car manufacturer, like Tesla, can succeed by doing something really different. Tesla founder Elon Musk believes that while Teslas are starting out as super-expensive cars with lackluster range, his Apple-like company has a decisive advantage over its sluggish, old-fashioned competitors, which rely on unwieldy networks of suppliers. Musk could be totally wrong. The fact that other smart entrepreneurs aren’t clamoring to do the same thing is kind of a bad sign in itself. But it also means that if Musk is right, he is going to be really, really right. He won’t just compete with other car companies by shaving a few dollars off the sticker price of a familiar product—he will force them either to adapt to what he’s doing or go out of business. Unlike Tesla, Amazon hasn’t flourished by zeroing in on one stodgy business—as anyone who has spent any time at Amazon.com knows very well, Amazon does about a million different things, from providing cloud computing services to streaming highbrow original dramas like Transparent. Instead, Bezos’ company has flourished by being extremely good at solving hard logistical problems. The company has mastered the art of complex coordination, and this allows it to go where other companies can’t. The domain in which you can kinda sorta say Amazon has a monopoly is e-books, where, per Foer, Amazon controls 67 percent of the market. Note, however, that Amazon competes with Apple, the world’s most- or second-most-valuable company, for the e-book market. Amazon doesn’t have such a commanding position because it invented e-books as a category. Rather, it was the first to succeed in creating a seamless experience for readers, complete with a vast catalog of titles to choose from. Coming up with the idea that it would be way easier to have a handheld device full of e-books than to lug around a library was the easy part. The hard part was making everything fit together. That’s what Amazon did. Legend (and reporting from the indispensable Brad Stone) has it that when Bezos put a trusted lieutenant in charge of his all-important e-book initiative, he told him to act as though his mission was to put physical books, Amazon’s bread and butter, out of business. When people marvel at Amazon’s amazing ability to lose money, what they often miss is that, as Benedict Evans has made clear, it is best understood as a bundle of different companies under the same roof, some of which are relatively mature businesses that are spewing out tons of cash and others that are essentially scrappy startups. Google, a company that has a lucrative near-monopoly in search engine advertising, sits on a ton of cash and finances various other businesses in an effort to seem cool (writes the cynic). By contrast, Amazon stretches itself to make huge capital expenditures. Bezos is, for whatever reason, less interested in goosing Amazon’s stock price than in building new fulfillment centers, investing in new technologies, and doing all kinds of other things that involve more actual engineering than financial engineering. This brings us to a funky contradiction. Most of us believe that patents—legal monopolies that entitle you to all of the benefits from your invention for a limited period of time—are an OK idea because you have to give people some ex ante incentive to do the hard work of creating new things. You and I might both believe that the U.S. patent system has gotten way out of hand, but it’s hard to argue that patents are always a terrible idea. But what about the incentive to engage in the kind of complex coordination that creates enormous value, that raises productivity and delivers lowers prices, that can’t actually be patented? When we decide that Amazon is just a little too innovative and a little too tough, what is the message we’re sending to the next entrepreneur who is debating whether to take on the thorniest challenges? No, I’m not saying that it’s OK for Standard Oil to come along and gouge its customers because we don’t want to discourage future robber barons. I’m saying that having the government step in and squash Amazon before it actually uses its (supposed) pricing power to screw consumers will likely yield less innovative entrepreneurship. The only people who will win in this scenario are the mostly wealthy people who own shares in lazily managed companies. Hurray. We’ve all heard of Adam Smith’s “invisible hand” that guides the free market. The invisible foot is the invisible hand’s brutish older brother. It is the force that sees to it that capital gets reallocated from firms that aren’t doing their jobs to firms that are by putting the former out of business. The invisible foot has seen better days. In sector after sector—banking, broadband, and utilities come to mind—large incumbent firms have found new ways to protect themselves from competition, whether through coziness with regulators of sweetheart subsidy deals with politicians on the make to a pathetic lack of imagination among entrepreneurs who refuse to take on the toughest challenges. The sectors that Amazon takes on are the big exception. Instead of damning Amazon, we need to be asking why we don’t have more companies like it.